Today was a different kind of ride than yesterday. Today we took the Davis Bike Loop, a quite well-signed and mostly separated 12 mile loop around the city of Davis. Ordinarily, 12 miles of flat would be pretty boring. 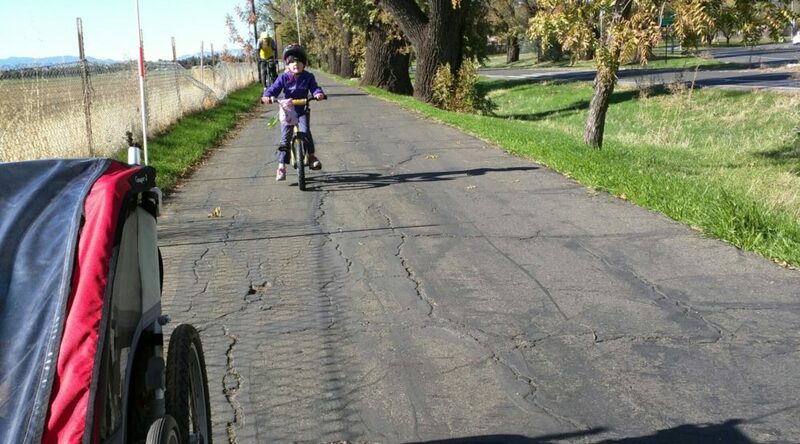 We jazzed it up by riding it with 4.5 year old Ruth taking her own bike. I was worried about the ride going into it. The route is mostly bike path, but parts are on roads, which Ruth had never ridden on before. 12 miles is also a long way. We certainly didn’t set any speed records, but it went really well. The plan was for Anne to go first with Max in the trailer. Ruth would follow, with instructions to stay behind and follow Mommy. I would go behind, coaching Ruth on lane position, watching for obstacles and traffic, and generally keeping things moving. We checked out of the hotel and pulled out of the parking lot to start out on road. Ruth did a good job of following and keeping her position. After half a mile or so, we were on the path. Davis being a college town during a holiday weekend, the path was pretty quiet. We meandered through, cutting through parks and gardens. Anne tended to get a bit ahead, which meant Ruth could be a bit inconsistent with speed. I wanted to follow pretty close, which meant I needed to match her. It was never too fast, but I sure needed to keep my hand on the brakes. We stopped at a playground at about the halfway point to let the kids run around. Ruth said she was having fun, but also using up her energy. That didn’t stop her from chasing Max around the playground, of course. She seemed excited about finishing the ride, so we got moving again. There were several bike overpasses. Sometimes, Ruth would power up them. Sometimes she’d need to walk the bike a bit. After all, she’s on a single speed cruiser. At the top, she’d cheerfully hop back on and coast down the hill. She did well on the road, although I think she got tired of my reminders about positioning. “I know, Daddy.” “I know you know, but i have to say it anyways.” Only once did she veer too far to the left, but a stem reminder corrected things. We got to a stoplight which turned yellow after Anne passed through. Ruth followed my directions to stop, and we went through at the next one. At one point, Ruth thought it would be fun to sneak up on Mommy. That was kind of fun, but “tiptoeing” up involved going slowly. I tried to encourage fast tiptoeing, but only with partial success. We passed through some community gardens, growing all sorts of veggies. Anne was jealous. As the ride wore on, I could tell Ruth was wearing out. She wanted to stop for water more often. She would stop on the uphills a little sooner. She’d also straight up say she was getting tired, although that she would see if she would finish. I told her I thought she would. The last bit had some overlap with the end of yesterday’s ride, although we took a slightly different route through the campus. Finally, we made it back to the hotel, were we had left the car. Ruth had ridden the whole thing! We packed up and got lunch, where Ruth enjoyed a much deserved cookie. As a now biannual tradition, we’re spending the weekend after Thanksgiving doing a little mini bike tour. Two years ago, we did an overnight loop between Napa and Sonoma valleys. Last year, Max was five months old, so there wasn’t much biking. This year, we’re in Davis, doing two days of rides. Much like Sutter Creek in the summer, we’re doing it as two one day loops, operating out of a single hotel. Today was the long day – 56 miles and a pretty gentle 1000 feet of climbing. By the time we were ready to roll out of the hotel, it was almost 10 am. So much for an early start. It was still cold, though, around 42 degrees. We bundled up Max in a jacket and under a blanket in the enclosed Chariot trailer. Ruth is pretty exposed in the Hase, so we got her in a regular jacket, her rain jacket, and rain pants. After we got out of town, Ruth started comparing about her face and hands being cold. We got her hood up, which seemed enough to keep her face warm. We didn’t have any gloves for her, though. We spent some time trying to get Anne’s extra fingered gloves on Ruth, but she wasn’t having it. Eventually we convinced her to pull her hands into her sleeves if she was cold. The morning was spent biking through orchards and the occasional vineyard. We had a pretty steady tailwind for a while, but then we’d turn, and it’d became a crosswind. Suddenly that nice speed boost would be an instrument of chill. Then we’d turn back, and it would be nice again. We stopped for lunch just as the climbing started. We had an audience of wild turkeys and cows, which the kids enjoyed mooing at in between bites. By this point it has warmed up a bit, so we could put away some of the gear, and get onto the climbing. The climbing section was through some foothills to get to the valley before the big hills. It was short, mostly pretty mild climbs, with some small downhill in the middle. 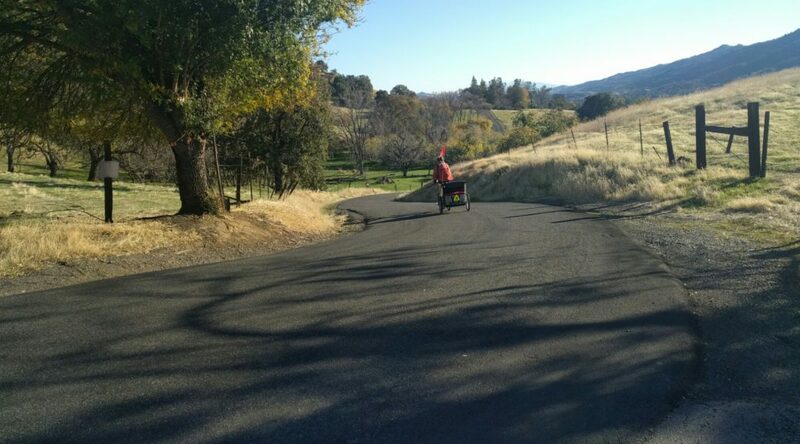 I was a bit anxious about losing control while climbing slowly, like on our last ride around Mt Diablo. On one bit, I freaked myself out at a switchback and had to walk. When I saw Anne just power up, I knew I could do it. Ruth helped pedal, too, and it was just a bit more to the summit for the day. The descent was nice, although it had too many blind corners to be able to really open up. There were nice views of the next set of grander hills, and the valley below. It was pretty short, but that was really all that we had earned. Then it was back out the valley and through more orchards and ranches. We saw lots of cows, horses, even llamas, a few sheep, and some chickens. And some dogs, which were fortunately effectively fenced in. One downside to riding in late November is that the days aren’t really very long. It started to get cold again, and dark. We put on some more clothes, turned on the lights, and kept going. There was a nice sunset on the hills, but it was behind us, so we really didn’t get to see it. At one point, the angles were right so that the sun was lighting up all the retro reflective stuff on Anne’s jacket, backpack, and the trailer. It’s nice to see it working. As we got close to the Davis city limits, our route put us on a bike path that ran parallel to the road. It was nice, although it randomly switched which side of the road it was on. Fortunately, traffic was light enough that it was easy to cross. Finally, we cut through the UC Davis campus, went over I-80, and back to the hotel to find dinner.